The Gendarmerie and Cinema Museum invites you to discover the history of its building. Before becoming a symbolic place thanks to the movies about French Police Force (with Louis de Funès), this building welcomed the real Police Force from 1879 to 2003. You carry on the visit with an explanation of the picture of the police in the cinema field, then an introduction of the cinema history in Saint-Tropez. This particular space of the museum reveals the movies realized in the Gulf of Saint-Tropez, but also the different positions available around the cinema field. Next stop during the visit, you’ll discover the myth versus the reality of Saint-Tropez through the cinema industry. On the ground floor, there is the Art Exhibition Hall. 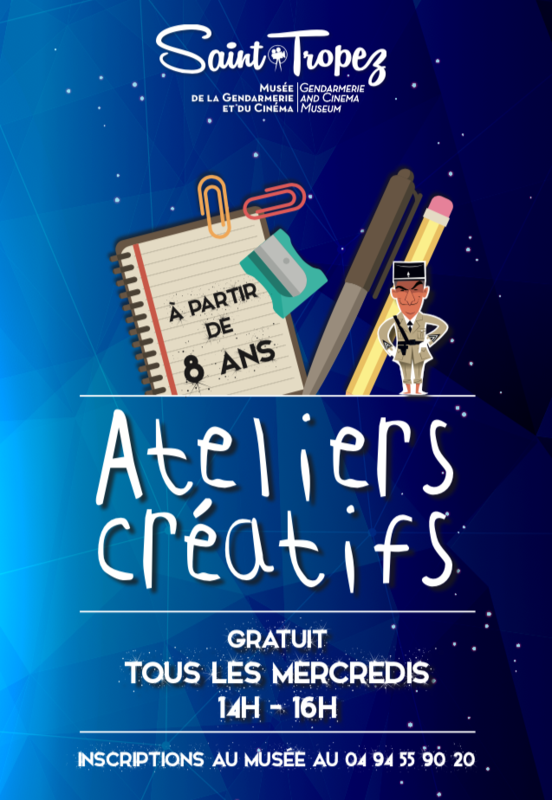 The Museum of gendarmerie and cinema Saint-Tropez offers free creative workshops for children from 8 years every Wednesday from November 7, 2018 from 14h to 16h. To register your child, you can contact the Museum on 04 94 55 90 20. We ask each child to bring an object that they wish to customize. Reduced rate : 2 € (12 - 18 years, students under 26, gendarmes and jobseekers with valid ID). Free admission : under 12 years, for everyone on European Heritage Days, the European Night of Museums and for members of ICOM on presentation of their card. The museum will be closed on January 1st, March 11th to 24th, May 1st and 17th, November 18th and 25th, December 2nd, 9th, 16th and 25th.